Livestock was established in 2010 at The Market Studios in Dublin by Joan Healy, Louise Ward and Francis Fay. Livestock continues today with Francis Fay & Eleanor Lawler as co-curators. Livestock is an artist-led initiative set up to support, encourage and promote performance, the artists and their work. The bi-monthly event is an opportunity for performers to show new or evolving work. Central to their ethos is the creation of a positive and welcoming environment where artists can perform their live work to an appreciative audience. We believe performance facilitates a relationship between artist and audience, creating an intimacy and a space for dialogue between both parties. Livestock has been part of Dublin Live Art Festival since 2012, exposing Irish performance artists’ work to International artists taking part in the Festival. Check out Livestock on Facebook, Twitter, and Instagram. Eleanor Lawler’s work concerns ideas around domesticity, being female and the ageing body. 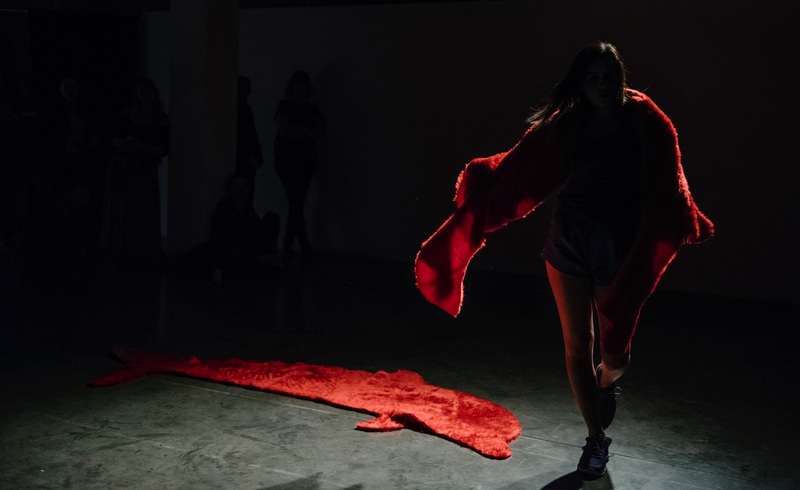 These concerns manifest as performance, textiles, movement, installation and film. Eleanor has been performing since 2011 and has been fortunate to have performed in Europe and USA. Francis Fay uses performance art to explore forms enhancing our understanding of reality, by investigating intimately the physical and spiritual seduction of location. He is especially interested in points of intersection wherein worlds collide and in which the inner landscape intertwines with what we know and can see for ourselves. Reclamation is one of Fay’s key objectives. Queering traditional ritual, he uses it as a lens through which to reframe bodies, subjects and places, bypassing veils of illusion, habits and patterns in order to respond to the world through direct experience, connecting to the elemental, and ultimately conversing directly with the source.